The star Indian cricketer Sachin Tendulkar is reported to earn more than £20 million a year, mostly from commercial endorsements. Saurav Ganguly can charge up to £225,000 for the endorsement of a single product, and players like Virender Sehwag have become rich from playing cricket. India has come a long way since the 1960s when leading player Chandu Borde was given two bats for endorsing a bat manufacturer. This is a snippet from a work edited by academic Boria Majumdar who reprints some gems of India’s cricketing history. Though many of the articles have been cited in previous histories, many are presented to western eyes for the first time in this impressive reader. With cricket being a consequence of the development of the country, the book opens with its earliest reference written in 1737 of a game played (in 1721) by soldiers. The first notice of cricket in Calcutta comes in January 1804 with a contest between the Etonian Civilians and the servants of a company, under the name of the Rest of Calcutta. 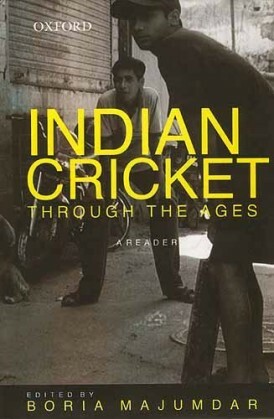 Thus, was the link between cricket and imperialism established, and then celebrated by the Oxford Historian Cecil Hedlam: “First the hunter, the missionary and the merchant, next the soldier and politician, and then the cricketer – that is the history of British colonisation”. The British encouraged communal cricket, in which the different ‘races’ would play against each other, matching a vision of a diverse country in which imperialists played the key role of umpiring antagonistic groups. Some of this resentment spilled over onto the cricket pitch, through rival supporters, whilst communal discord within the team accounted for the poor results of the 1932 tour to England. Cricket offered something to the Indian elite. It proved a great social reformer, argued Parsi Historian J.M. Framjee Patel, influencing dress, manners, and much else besides. A Cambridge professor told his Indian students that if Indians beat Englishmen at cricket then eventually the door of social and political privileges would open to them. There is a fascinating tale about Bhupindra Singh, the Maharaja of Pataiala, selected to captain an Indian team at the age of 19. As a prince, he attended the Imperial Conference of 1918, and the Round Table Conference of 1930. He corresponded with Nazi Rudolph Hess and was treated to a tour of Berlin during the 1936 Olympics, accompanied by Eva Braun. In 1884, delegates to the Indian National Congress attended a game against Australian visitors in Calcutta. Today politicians abort important debates in order to associate themselves with India’s great passion. Cricket’s earning potential today is staggering, with businessmen speaking of how advertising exploits the favoured national pastime in the quest for brand awareness. It is ironic that an article in the Wall Street Journal warns that with commercialism you get the problems of match-fixing and players who care more about their endorsements than their side. This book would benefit from some commentary by the editor to put the more obscure articles in context, and no book should be without an index. However, this publication proves an excellent insight into the social history of India and would appeal to readers with an interest in this complex and fascinating country.